Free webinar presented by Anders Pink. Learn why continuous learning matters, how content curation can help to support learners and more. Register for Free! Does your learning strategy really meet the needs of the modern learner? They’re hungry to learn but also busy, impatient, and overwhelmed. Using insight from research and surveys, here’s what you need to know to ensure your strategy satisfies today’s savvy professional. Recall when you were once a learner deep in a learning environment? Chances are it was during your academic years. The stress to pass your courses let alone get good grades were always top of mind. Then why do we lack empathy for today’s learner and student? As a small business making the time for training can be challenging, but we’ve got some tips to make sure you can fit training into your schedule. Employee training has a lot of benefits, but how can you improve your employee training? Find out how L&D holds the key to business success. Training a global workforce requires training programs to be culturally sensitive. This article gives insights into 5 critical elements that are essential to design culturally sensitive eLearning. How can you build effective compliance training on a budget, whilst still ensuring it’s useful and engaging? Take a look at our article below to help you get started. As the second article in our series celebrating the science behind learning, we will examine Giacomo Rizzolatti’s breakthrough research in mirror neurons and ask the question: are we hardwired to learn through human interactions? With over 300 LMS applications, it may be difficult to drill down the best LMS solutions. Here’re some considerations to keep in mind so that you only pay for the things you need. Learn why understanding your customer is the first step in starting your online learning business. Enhance your safety training by using a big-picture approach: first, find a hook and write your story, then choose the right combination of learning approaches to create unconventional safety training that meets compliance standards and reinforces your culture and philosophy. There is a push towards the integration of technology in training environments to enhance the learning experience, but no set limit, no deﬁned structure, no curated approach that tells us how far we can go, or how creative we can get when leveraging technology for training. The tech-savvy, next-generation workforce, is a provoking force whose learning habits, characteristics, styles, and expectations can guide innovation in corporate training. CLOs and learning directors from all industries have achieved tremendous savings with blended learning. Understand when and how a blended learning approach works best, and you can, too. Learn how to best train retail employees to compete with online sellers. Consumers of learning want to be entertained, and they want the same consumer benefits they already enjoy in their personal lives also available in their professional lives. The Training Manager reports directly to the Vice President of HR & Leadership Development and is responsible for assessing organization-wide training needs to drive training initiatives and identify and arrange suitable training solutions for employees and HRC volunteers. The Training Manager also actively searches, creatively designs and implements effective methods to educate and enhance job performance as well as acts as an administrator for HRC’s learning management systems. What if your career could change your life? Working at Mayo Clinic is making a difference. It’s providing the highest quality patient care by placing the needs of patients first. At Mayo Clinic, you’ll discover a culture of teamwork, professionalism and mutual respect — and most importantly, a life-changing career. Configure online learning systems and education technology for the Kaiser Permanente School of Medicine as Project Manager, Education Technology. The Training Center at CPS HR Consulting is looking to hire an experienced eLearning Designer to work intermittently to design and develop learning experiences in the forms of instructional material, training courses, and multimedia technologies. In this position, you can enjoy the flexibility of working from home. SweetRush makes the shortlist for the Excellence in Technology Innovation Award with an inventive virtual reality learning program, and earns a coveted spot as a finalist in the CLO Learning in Practice Awards 2018. Docebo picks up multiple awards and accolades, including 9 customer-submitted Brandon Hall Group HCM Excellence Awards. eLearnz 2018 is a virtual Web Summit that brings together the world’s top learning tech speakers. The company was nominated in the Leadership or Skills Development Solution Provider of the Year category at the Stevie Awards for Great Employers 2018. Winning AllenComm courses include innovative learning technology and custom content for Fortune 1000 clients. The webinar 5 Must-Haves In An LMS To Get Mobile Learning Right is sponsored by eLearning Industry and presented by Katrina Marie Baker, a Senior Learning Evangelist of Adobe. In this webinar, you will explore how an LMS helps you integrate mobile learning into your training strategy so that your remote employees have access to learning resources even when they are offline. Meetings, presentations, sales, and training sessions are increasingly performed virtually. For those who are used to training face-to-face, going virtual can be a challenge. Seasoned professionals may have blind spots & amateurs often struggle. The webinar Continuous Learning In Your LMS: Why It Matters, How Curation Helps, How To Get Started Now is sponsored by eLearning Industry and presented by Stephen Walsh, co-founder of Anders Pink. 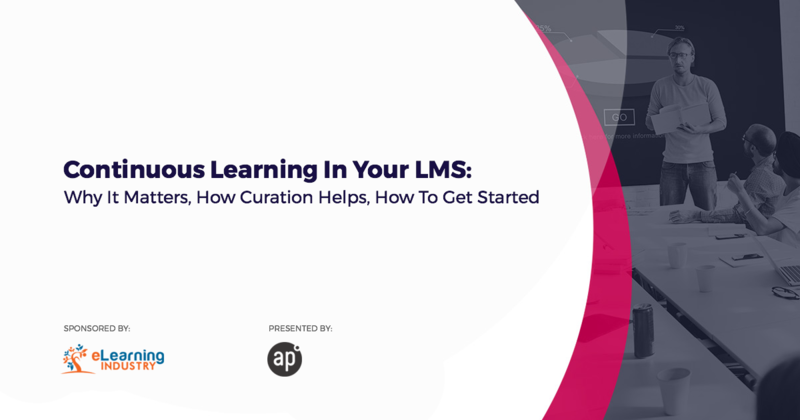 During this webinar, you will discover how content curation helps you add fresh content to your LMS to promote continuous learning and make it so much more than just a repository of courses. LITE 2018 – Learning, Innovation, Technology, and Evolution. The webinar The Ins And Outs Of Building A Mobile Learning Strategy is sponsored by eLearning Industry and presented by Debbie Richards, one of the most influential people in corporate eLearning for 2018. During this webinar, you will discover how to implement a mobile learning strategy specifically targeted to your organizational needs. Confused about what to do after graduation? Actually, life after graduation is mesmerizing as we are at the stage from where maturity comes in, so it’s a fact that this infographic has something for everyone. The aim of the General Data Protection Regulation (GDPR) is to create a uniform level of data protection in the European Union (EU). Before the EU data protection becomes enforceable, it is crucial for organizations to ensure their compliance with the GDPR requirements. It’s the ACT test that you’re going to take or retake, and you know just how important it is. The ACT test is basically the standardized test that will open new doors for you. It can help you get you into the college of your choice or receive a valuable scholarship if you achieve a high score. In this Adobe Captivate video tutorial, I will share with you an almost hidden feature, known as Advanced Answer Option. In this Adobe Captivate QuickTip, I briefly explain my thoughts on what resolution you should use for your fluid box responsive design preview.